What if you could impact employee health every day? Castlight Health's mission is to empower people to make the best choices for their health and to help companies make the most of their health benefits. We offer a health benefits platform that engages employees to make better healthcare decisions and can guide them to the right program, care, and provider. The platform also enables benefit leaders to communicate and measure their programs while driving employee engagement with targeted, relevant communications. Castlight has partnered with enterprise customers, spanning millions of lives, to improve healthcare outcomes, lower costs, and increase benefits satisfaction. 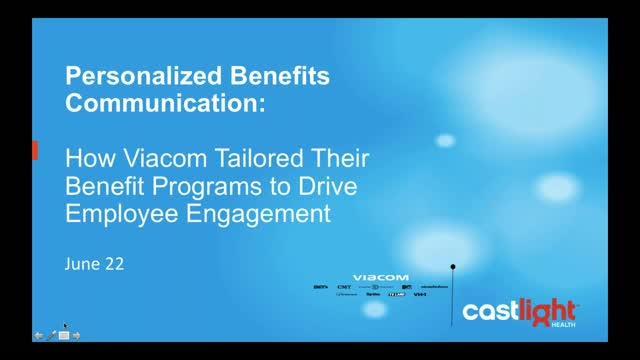 In this webinar, Viacom Vice President of Employee Benefits, Adam Entenberg, and Castlight Vice President of Sales and Alliances, Seth Cohen, co-present on the foundations of the program and to-date results. • Personalized Outreach: How tailored communications and recommendations can help drive engagement. • Actionable Insights: How Viacom mined user data to trigger highly personalized and targeted campaigns. • Integrated Platform: What an integrated platform can do to simplify benefits administration and utilization. So how you can you make sure your employees know what they need to know about their benefits? And how can you optimize employee engagement without creating more work for HR? How to empower employees with personalized information about medical, pharma, and wellness. When it comes to embracing health benefits technology, many employers are still on the fence: They're excited by the prospect of greater efficiency and employee satisfaction, but overwhelmed by the wide array of programs and providers. Castlight and Jiff have recently joined forces with the goal of building the most comprehensive health platform on the market. Together, the combined company will serve more than 240 customers, including over 70 of the Fortune 500, and will seek to improve every aspect of an employee’s health experience: from staying healthy, to accessing care, to managing a condition. During this webinar, Castlight’s Derek Newell, Pierce Graham-Jones and Maeve O’Meara provided a sneak peak of the combined product, and preview some exciting innovations that are already in the works for large employers. Reaching employees is harder than ever! Employee communications are not getting through because they’re competing with more than 280 messages every day. Getting employees to engage with their benefits, let alone pay attention, isn’t just an email exercise. Employers need a marketing strategy to drive real engagement with benefits. It’s a journey and mentality that many leading employers are now adopting. Listen to Samantha Goldman, Head of Consumer Marketing at Castlight Health and learn a simple framework to get started on marketing benefits. Want employees to engage more with their benefits? Then you’ll need to meet them where they are — on their smartphones. Join featured speakers Jonathan Rende, Chief R&D Officer at Castlight Health, and Ruta Raju, Castlight’s Senior Director of User Experience & Design, to learn how mobile is changing the rules of engagement. In 2016, NetApp transitioned their wellness program to a platform-based model, utilizing technology and services powered by Jiff. NetApp’s goal was to deliver a highly engaging and fully comprehensive suite of wellbeing tools to promote healthy minds, bodies, and wallets. In this webinar, NetApp’s Rachelle Taylor will review the results of the initiative, as well as her vision for the future. Engage employees by overcoming communication overload. You've probably heard about the opioid epidemic – the abuse of opioid drugs, including prescription painkillers as well as heroin and other drugs. But do you know how it's impacting your workplace? Moderated by Dr. Greg Curfman, Editor in Chief, Harvard Health Publications, watch and learn from Harvard and Castlight subject matter experts. As healthcare costs continue to increase, what strategies should employers consider to hold down costs? How can they best engage employees? Explore trends to consider for the new year by viewing this on-demand webinar. Get the facts about mental health in the workplace and hear what Sprint is doing to address behavioral health issues in their workforce.